Rotorua dairy farmer, Mark Dibley, talks about how changing from turnips to chicory as a summer fodder crop increased profit and reduced nutrient losses. 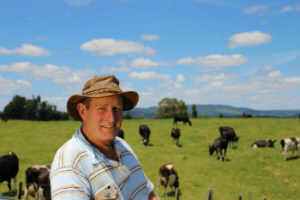 The Dibley family has been dairy farming in Rotorua for over 130 years. Mark is the fourth generation of the family to farm their 234 hectare property that enjoys fantastic views across Lake Rotorua. Mark and Sophie milk around 570 cows and, like other Rotorua farmers, they’re coming to grips with the challenges of farming within nutrient limits. Growing Chicory as a fodder crop instead of turnips is one of the solutions they’re trialling to meet these limits. We went to chicory because it is going to benefit us for our nitrogen leaching off the farm more so than what turnips did. We’ planted 15 hectares of chicory this year. It’s the first time for us and it’s for one herd, So we’ve got 450 cows on the chicory and that will keep us going about 2 or three months. I had to get my share-milker on board. I thought perhaps half chicory half turnips for the first year He was happy to go the full chicory way. Which we did and I’m quite pleased that we did. It’s quite critical of planting time with chicory, Soil temperature has to be about 12 degrees which is usually mid-October around here. We spray the paddocks with Roundup, kill everything out then we go straight in with the drill and drill the seed. The direct drilling will help our nitrogen and phosphorus losses mainly because the paddocks don’t get turned over and you won’t get the leaching out of the soil. The other benefit is when it goes back onto young grass we will just drill straight back in as well so there is no tillage of the soil. Chicory does grow quite fast, so it’s about 8 to 10 weeks once its drilled. And then we start grazing. it This paddock here was sown about three to four weeks ago and you can see that it has taken off really well. The optimum grazing level is about 7 to 9 leaves and about 30 centimetres high. The chicory grows pretty well in a drier summer because it’s got a longer tap root. This paddock will be ready to graze in a week. The cows come into the chicory after their morning milking and they are on there for 2-3 hours and then they go off into their pasture for the day. They’re getting about .9 of a hectare in this break for the day. On the plus side, you can graze chicory longer than turnips. With turnips you graze it right down to the dirt, you graze it once and it’s finished. Chicory you graze several times. Once you graze it you’ve got to get back to it within 17 days. After 17 days it tends to get a bit woody and then the cows won’t eat it and it won’t be as palatable. We will re-grass again in the Autumn. It will be a little bit later because of the way chicory goes. Turnips usually goes back into grass a bit earlier. It won’t make much difference because you won’t be milking on it until the spring. We’ve been grazing the chicory for a week now and we’ve noticed that the milk production has gone up a bit. The cows tend to like it, it’s pretty leafy and they seem to be loving it. An OVERSEER analysis indicates changing from turnips to chicory reduces nitrogen leaching by one kg per hectare, averaged across the whole farm. This is largely due to avoiding conventional cultivation at crop establishment. FARMAX analysis indicates that chicory, compared to turnips, improves profit by about thirty-four dollars per hectare at a milk price of five dollars eighty per kilogram of milk solids. Changing from turnips to chicory reduced nitrogen leaching by one kg per hectare, averaged across the whole farm. This is largely due to avoiding conventional cultivation at crop establishment. FARMAX analysis indicates that chicory, compared to turnips, improved profit by about thirty-four dollars per hectare at a milk price of five dollars eighty per kilogram of milk solids. Chicory crops will, on average, tend to have similar total forage yields to turnips but, as a multi-graze crop, chicory yield will be spread out over a longer time period. You can view the full nutrient and cost analysis here. Chicory is a multi-graze crop and can be incorporated into a rotational grazing system through its active growing months, September to May. During this period it yields 8-16 t DM/ha (average = 10.6 t DM/ha). Chicory has high tolerance to insect pests and provides dairy farmers with an alternative to turnips in areas where insect damage is a problem. Its regrowth potential also provides more grazing flexibility compared to turnips. Milk responses to chicory in summer have been measured at similar levels to turnips (40 g MS/kg DM). Growing chicory on an effluent area can remove large amounts of nitrogen and potassium which will be redistributed around the farm by grazing cows. This reduces the risk of nutrient leaching and metabolic disorders resulting from excessive potassium. Forages for Reduced Nitrate leaching – Dairy NZ Canterbury farmers are participating in a research programme led by DairyNZ to develop profitable solutions that reduce nitrate leaching. Cadmium Accumulation by Forage Species – trials indicate chicory accumulates cadmium at greater rates than pasture and other forage crops. This needs to be taken into account in livestock cadmium accumulation risk assessment models. The information provided in this video series is for general guidance only and is not intended as a substitute for farm specific advice. Mitigation tools, technologies and products will continue to evolve. Lake Rotorua catchment farmers can contact BOPRC’s Advice and Support service or a professional nutrient adviser.